The 2013 Nissan GT-R is still about 6 months away from release in the US, but it has been undergoing testing in Germany both at Nurburgring and on the Autobahn. From the video, the picture above shows three improvements to the VR38DETT engine. Nissan is increasing intake efficiency, improving the exhaust efficiency, and a changing the engine control system. 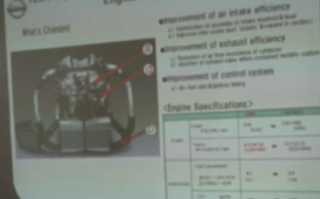 For 2012, Nissan changed the inlet pipes to the turbos, and gained about 17 hp in independent testing.. They also changed a tube in the exhaust system, along with the ECU tuning to bring the 2011 485 hp car to 530 hp for 2012. For 2013 the rumors say anything from 550 hp to 580 hp is expected. We have to wait a few months to get the real numbers on the horsepower increases. In the video below, watch the 2013 Nissan GT-R on the Autobahn at 300 km/hr. 2012 models in Japan on July 11 (US2013) GT Nissan is announced-R. German Autobahn and the ride on public roads which little earlier. There is also footage of a super-car 300km / h on Autobahn unlimited period.